A washer-disinfector, as its name suggests, is a machine for the disinfection of medical material. These devices disinfect non-invasive items in preparation for subsequent reuse. In addition, they are frequently employed for the preparation of surgical instruments and other material for autoclave sterilization. This is because autoclaving requires thorough preliminary cleaning to be effective. 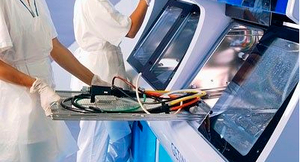 Some machines are designed to disinfect certain types of instruments, such as endoscopes. Today, such machines use either steam or ultrasound disinfection. There are both compact models requiring little storage space and high-capacity types suitable for large hospitals. Choice will depend primarily on the degree of disinfection desired, maximum load size and the amount of storage space the machine requires.